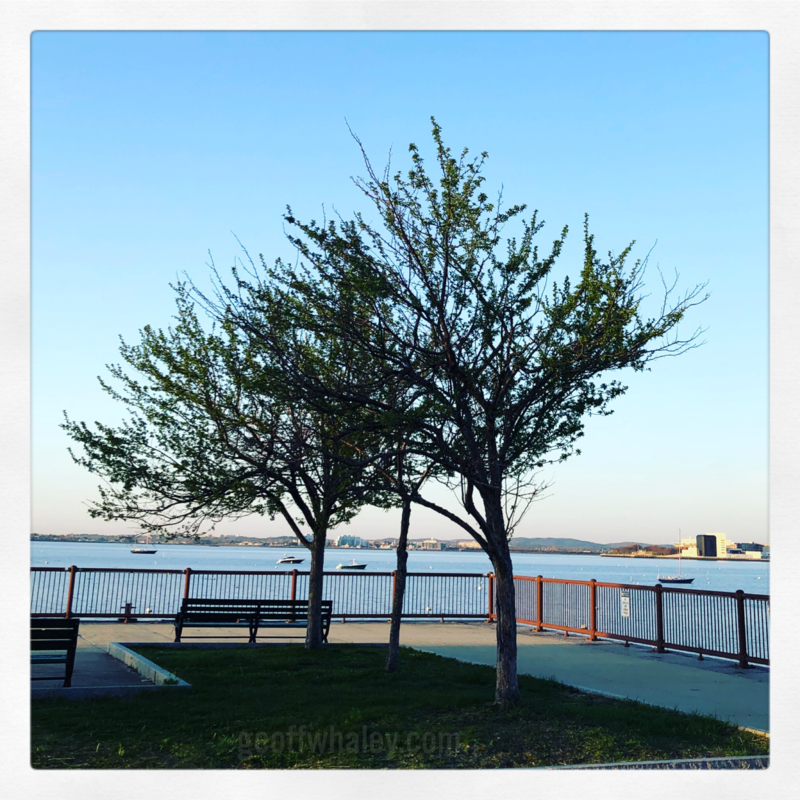 May was of course busy in that Tim and I celebrated four years together going to the delicious Mooo… (restaurant site) and seeing Ali Wong’s Hard Knock Wife live (Netflix link)! Tim got me the pasta maker attachment for our KitchenAid and it’s been wonderful we’ve made two different types and they’ve been delicious! And then at work we had graduation which was chaos because we’re such a small school and it’s all hands on deck. I read more than I thought I did and squeezed in Quietus at the last-minute. Mostly because I thought the last day was the 30th and had a surprise extra day on the 31st! The first and last books were galleys and the middle two were library books. I unfortunately grabbed quite a few more library books as well right at the end of May for our upcoming trips, but still have so many galleys even though I’m finally into my 2018 pile. The best book by far this month was No Straight Lines The worst book by far was Thriving Through Uncertainty, the first was incredibly broad and covered so much time and the second was just bad, go read it and bask in the horribleness of it. On social media this month I came across these two things. I’ve actually seen five of the adaptations in the first (started The Handmaid’s Tale but it’s TOO dark for me right now, thanks Drumf), and am curious about a few of the others on the list. The second was just such a unique way to do book ends, I mean Japanese alleys? Who thinks of these things. 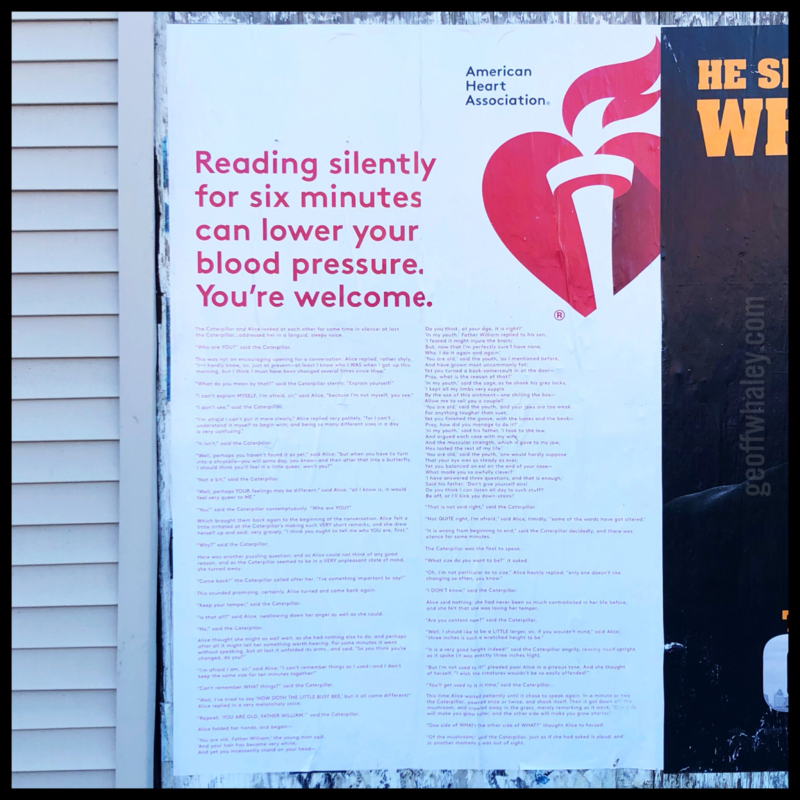 I also randomly came across this advertisement/PSA from the American Heart Assoication on a walk home from the bus. It’s a sampling from Alice’s Adventures in Wonderland and when I saw it, it just caught me off guard. Has anyone else seen one of these? Is it a national campaign? June is even busier than May! We’re seeing the new musical based on Alanis Morissette’s Jagged Little Pill (A.R.T. website) and I cannot tell you how excited I am! We’re also starting to get things ready and pack for our trip to Cozumel for a wedding of one of Tim’s cousins. We’re also starting to finalize plans for my friend’s wedding in the U.K. in July. I’m reading The Austen Escape by Katherine Reay and have picked up a few more by her (Dear Mr. Knightley, Lizzy & Jane, and The Brontë Plot). and I picked up Alison Bechdel’s collection of The Essential Dykes to Watch Out For from her syndicated comic strip in the 1980s/1990s. And I seriously need to get some of these galleys off my shelf! There are two I may just pass on, but I just feel bad about it. Do you have any exciting June plans? I didn’t realise there was going to be a Jagged Little Pill musical! If it comes to the UK I will definitely go to see it. That was my teenage rebellion album and I’m still very fond of it 😉 It sounds like you had a great month. I think this is the world premiere. There still technically workshopping it here. Geoff, sounds like a great May and lots more fun to look forward to this summer 🙂 As for me, in June, I have already enjoyed a trip to the theatre to see a fun take on Shakespeare’s The Tempest (it was set in space with songs!). While I have a WWII school trip (I am planning to dress up as a land girl), an Olly Murs tribute night and my book club meeting to discuss Vanishing Grace by Philip Yancey to look forward too 😀 So happy June! That already sounds like a crazy busy June! That Shakespeare sounds very interesting.